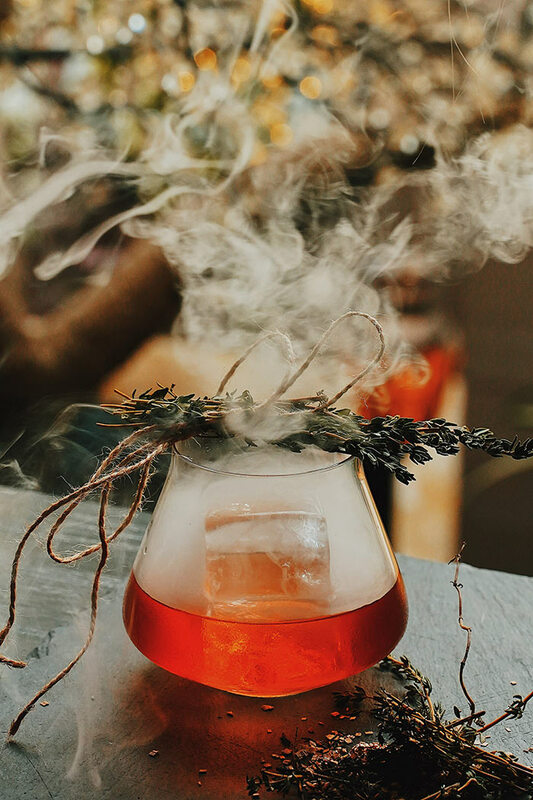 Drink Me brings you the entire world of drinks, from the best new spirits to killer wines, craft beers, and everything in between.It has become the go-to resource for drinks professionals and consumers around the world. From MyDrinkBomb, this sweet gift pack is the perfect pairing thanks to Mixologi and Sweet E’s Confectionery. Choose from four flavors: Moscow Mule, Michelada, Margarita or Pisco Sour. Each luxe, black gift box comes with a Mixologi 4-pack and two delicious cookies from Sweet E’s Confectionery. The post Cocktails & Cookies Gift Pack For Men appeared first on Drink Me. It’s cold! And it’s damp, and it’s overcast, and you need something to warm your insides and your spirits. Charity Johnston, Beverage Director for The Madera Group (Toca Madera and Tocaya Organica) to rescue. 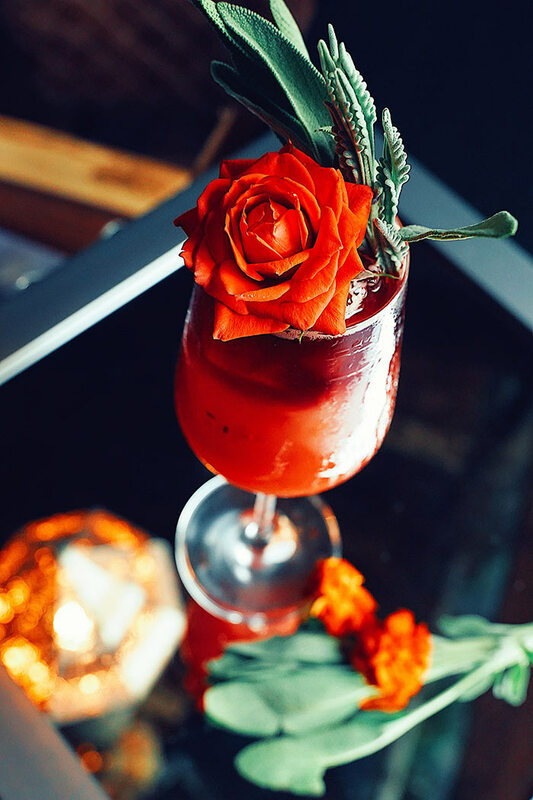 Charity has put together seven thoughtful tequila cocktails for Drink Me readers, to banish your winter woes and transport you to tequila tranquility. The post 7 Tequila Cocktails To Warm Your Body and Mind appeared first on Drink Me. Drink Me readers love their cocktails, but that doesn’t mean they’re unhealthy. Sometimes you want both, like a healthy cocktail. Sounds impossible? Read on. Bird & The Bottle in Santa Rosa, California offers a solution with their menu of Health Shots, specialty cocktails infused with fresh herbs and superfoods. 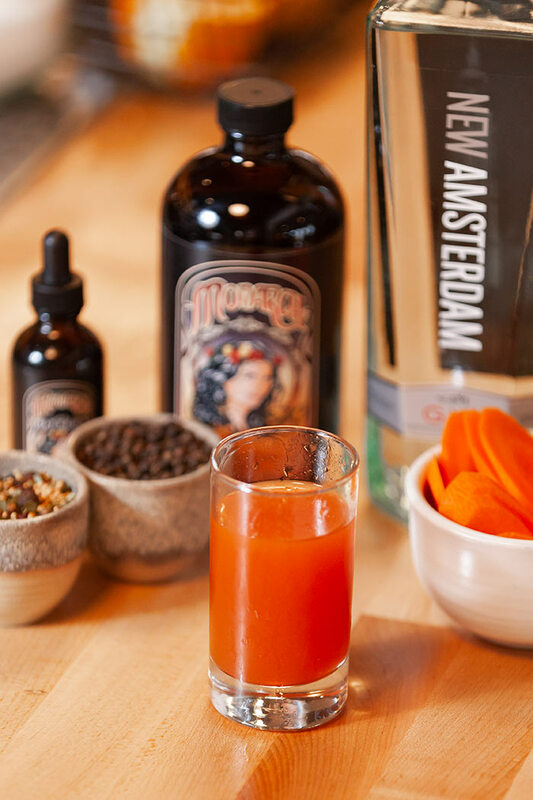 Carrot juice and house-blended Bird Spices combine with New Amsterdam Gin, Tonic Syrup and Cali Bay Bitters. Our mothers have always told us carrots help improve our eyesight, but studies show they may also reduce the risk of stroke. The house blend of Bird Spices includes peppercorns, which assist in the breakdown of fat cells. 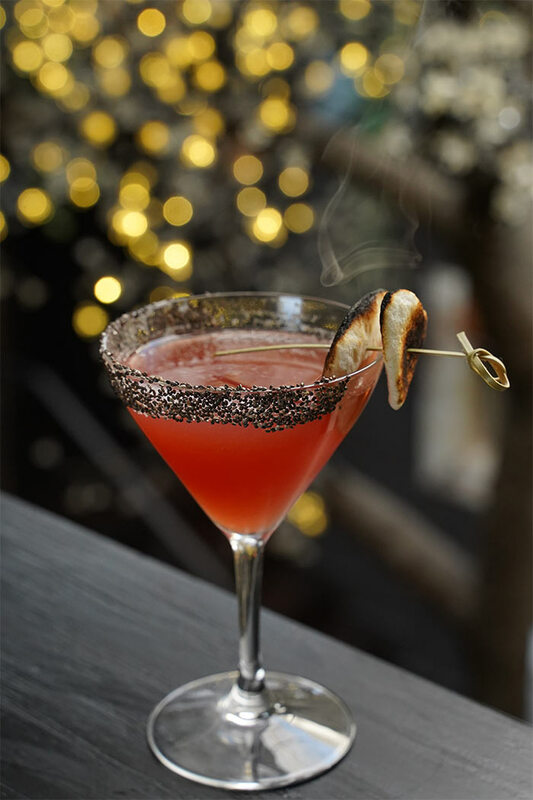 Fresh sage is combined with Dr. Zyzzx Desert Sage Vodka to give a double dose of this healthy herb. Sage has been shown to lower inflammation, improve brain function, prevent chronic diseases and boost the immune system. Add in antioxidant-rich blackberries and vanilla, which is thought to reduce anxiety and stress, and this becomes an all-around exceptional elixir. 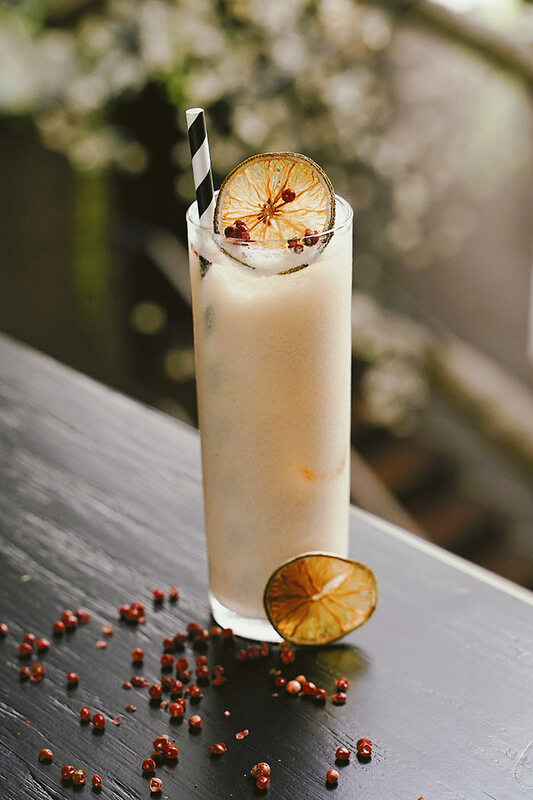 Bee pollen is the health star in this cocktail. Bee pollen is credited with a host of benefits including detoxifying the liver, improving prostate health, rejuvenating skin, and treating allergies. 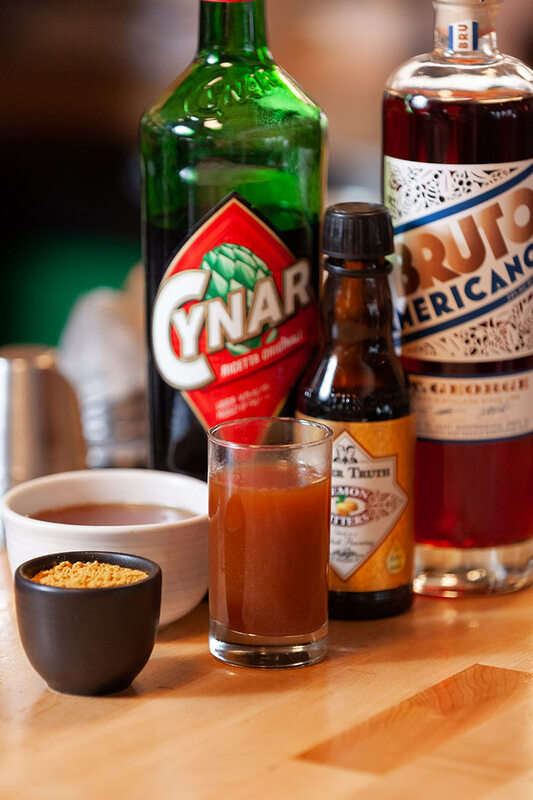 It is mixed with Cynar (an Italian bitter liqueur), Bruto Americano (another bitter liqueur), Lemon Bitters, and a little honey to balance all of the bitter components. 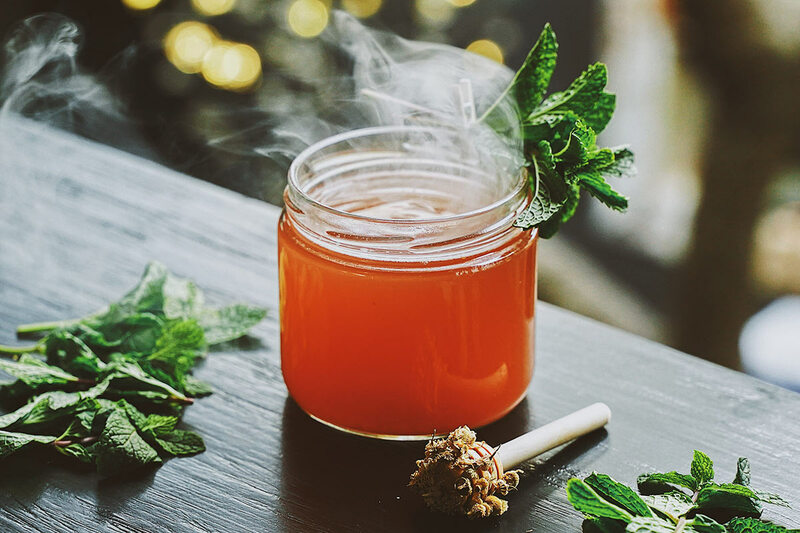 Honey has also been shown to lower blood pressure and cholesterol, promotes burn and wound healing, and can suppress coughs and allergy symptoms. The Bird & the Bottle is open daily and located at 1055 Fourth Street in Santa Rosa. Learn more at BirdandtheBottle.com. The post The Healthy Cocktail Paradox appeared first on Drink Me. What better way to kick off the new year than with National Hot Toddy Day. This Friday, January 11th create your own. What’s a Hot Toddy, you say? Shame! It’s okay…we’re here to educate, and Tullamore Dew and Fistful of Bourbon came along to help. 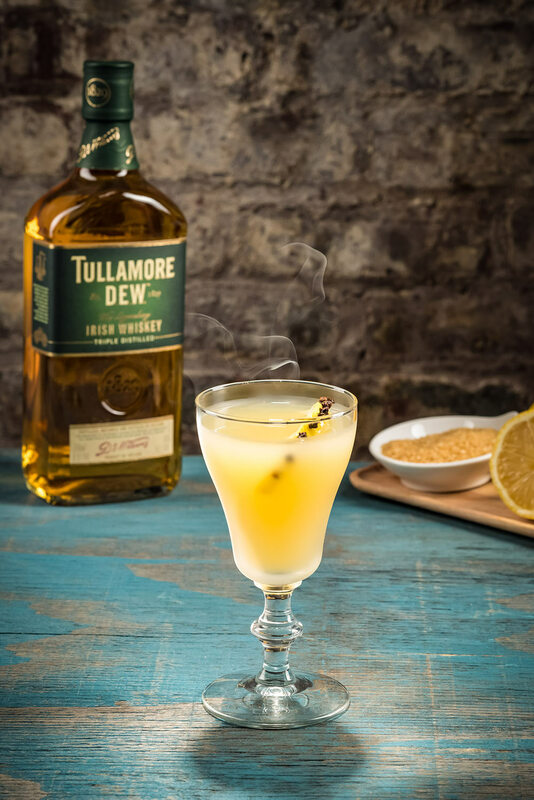 The Hot Toddy, a delicious and simple cocktail, is perfect to warm up from the cold winter weather. Build: First warm a mug with hot water, then discard water and combine ingredients above. Stir before serving, garnish with lemon. Build: Combine ingredients in a mug. Garnish with a large sprig of mint and freshly grated nutmeg. The post Surviving The Winter With The Hot Toddy appeared first on Drink Me. Raise a glass to Robert Burns with the excellent Glen Moray Peated Old Fashioned Cocktail, created by Neil Ridley and Joel Harrison from World’s Best Spirits. Build: In a mixing glass, add half the whisky, maple syrup, cherry juice and bitters. Fill with cubed ice and stir. Add the rest of the whisky, and keep stirring, adding more ice until the drink is diluted to taste. Strain into a chilled rocks glass over a large single cube of ice and garnish with a thin piece of orange zest, expressed over the glass and three cherries. Optional garnish of a couple of squares of dark chocolate. The post How To Celebrate Robert Burns Day appeared first on Drink Me. As a drinks editor I have the privilege of being among the first to discover new restaurants and bars. Birds & Bees is not a new location, but it is a hidden one, and here at Drink Me, we love that stuff. In Downtown LA, this speakeasy-stylized bar doesn’t have any signage, and the entrance is on the edge of a parking lot. Down the basement stairs you go, to find a positively charged group of people and a dark, somewhat steampunk, but friendly, spacious bar laid out in that deliberate “by-the-way” casual style, with board games distributed randomly on tables. It resonates the phrase “cheeky little thing” from the 1950s. It’s comfortable. It’s welcoming and it’s hidden. We love it. But let’s get to the point: the cocktails. 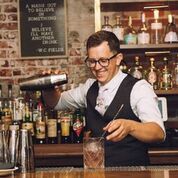 Ryan Koller is the General Manager at Birds & Bees and his mission there is to maintain a modern version of the old Trader Vic’s punch bowls and board games vibe, but personal, and with a lot more attention to detail. The cocktails here are masterpieces and even the punch bowl is a feat of balanced flavor and presentation. This place is “fun” in a completely understated way, and the cocktails are there to remind you how serious the mixology staff takes its trade. 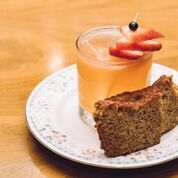 We asked the Ryan, and mixologist Jake Larowe, to taste us on 8 Can’t Miss Cocktails for our readers to either try at Birds & Bees, or recreate at home. This was Drink Me’s favorite cocktail of the night. It comes with Banana Bread folks. What’s not to love? It took 100 tries to get this one right, according to Ryan, but it was worth the effort. There are a lot of big contenders in this one cocktail, including añejo tequila, tawny port and cocchi barolo, but it works! This is how you get to Carnegie Hall. Delicate, floral, sensibly sweet with a smoky mezcal aftertaste that stays balanced (i.e. it doesn’t build with each taste). For such a layered cocktail, this remains super clean to the end. The menu reads, “This Harvard calculus professor turned satirical songwriter always was a little tongue in cheek. 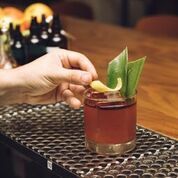 We’re sure he would enjoy this island negroni twist with a wink and a grin.” We agree. If you enjoy twists on the negroni, you’ll love this one. Look out for the house-made Tiki bitters which say a gentle “Hello” at the end of each sip. Straight up clove on the nose, you’ll first note sweet apple on the palate followed by that wonderful booziness we crave in all cocktails. It says hello with a high-pitched, summery voice, but gets very “Hey, Bartender!” within a couple of seconds. This cocktail delivers in stages, and you’ll enjoy every one of them. Far too easy to drink, this cocktail is dange-r-ous. 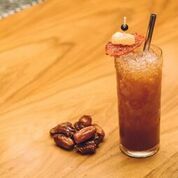 The tamarind is a nice surprise that sort of stands up mid-palate, and just the right measure of spice gives a quick goodbye at the end. You could easily drink ten of these, but you shouldn’t —- they’re not as innocent as they let on to be. Reading the ingredients below will illustrate to you how much effort has gone into balancing this cocktail. It’s multi-layered with flavors that make you salivate, and the result is a serious but welcoming recipe. 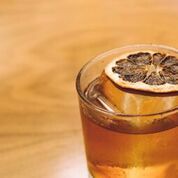 We particularly love Los Feliz’s Olho Do Tigre this time of year —- the nutmeg is a really nice touch. 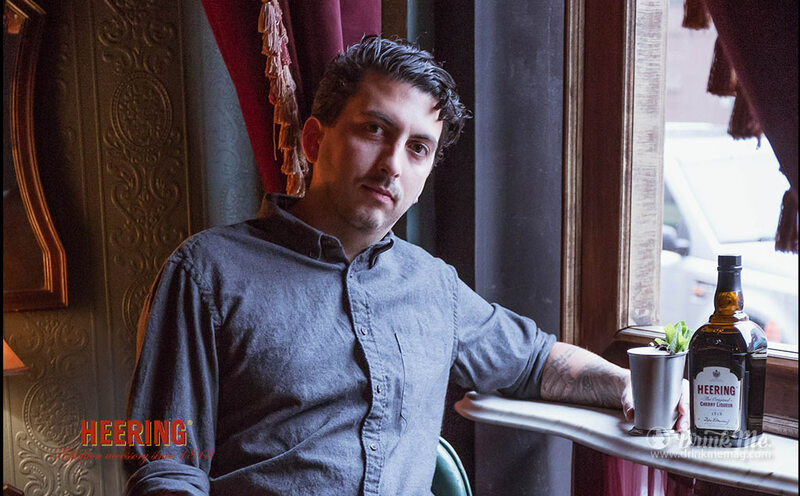 Jake Larowe is the Mixo-Genius at Birds & Bees. Ah, Gidget. You’re already smiling right? That’s how we felt when we spotted this cocktail, listed last, on the back of the menu. You gotta get a Gidget, especially in a hidden-away, cheeky speakeasy located in a basement. So we did. Guess what? 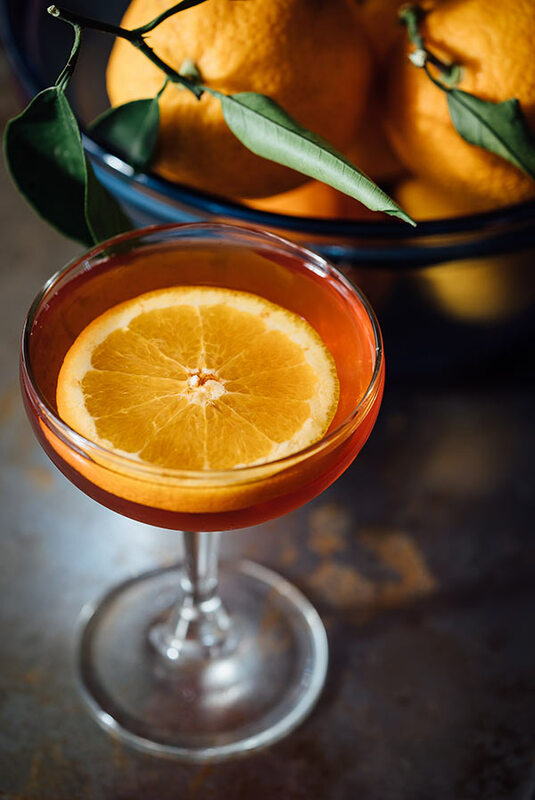 Gidget is a punch bowl and much like its namesake, it’s a good girl at only 12 – 15 percent alcohol. It looks fantastic and tastes even better. A great way to start or end your night out. 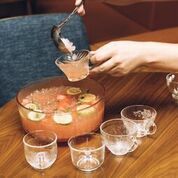 We really enjoyed the shareability of the classic punch bowl, particularly in a casual, comfortable setting like this one. It really lends well to the Birds & Bees’ vibe. The post Birds & Bees Is L.A.’s Best Kept Secret appeared first on Drink Me. ChocoVine is a mix of French Cabernet and Dutch Chocolate, with a 14% ABV. It’s easy-to-drink and serve, either on ice or in a cocktail. 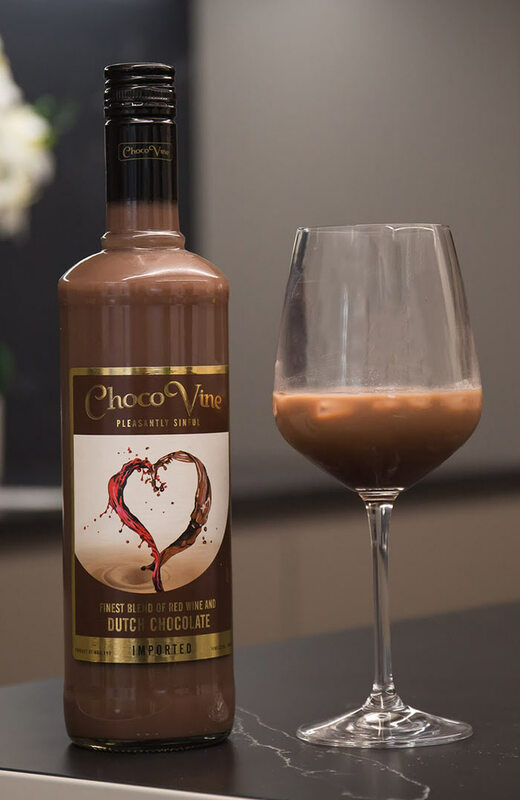 Designed in the U.S. and produced in the Netherlands, ChocoVine is the first brand ever to mix chocolate and wine and is sold everywhere from Total Wine to Target. It also comes in Dark Chocolate, Whipped Cream, Raspberry, and Pumpkin Spice. If you still need inspiration…here are a couple of cocktails to get you motivated. The post ChocoVine Luxury In Cocktails appeared first on Drink Me. 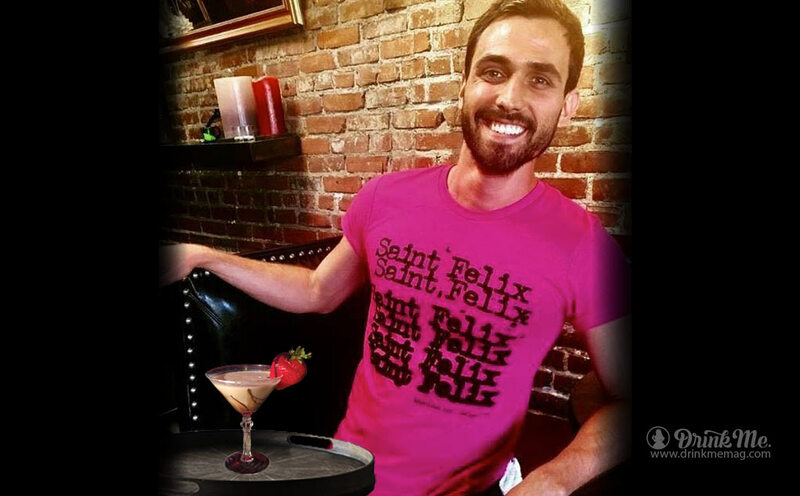 And on the Last Day of Cocktails our dear Zack Albanese from Tend, El Segundo, California gave to me….the Cherry Queen Martini. Four Roses Bourbon is an institution of the American whiskey category and is typically mixed to create grown-up cocktails like this one, and specifically mixed with liqueurs like Cherry Heering. Here’s why: Cherry Heering is quite likely the only cherry liqueur out there that actually tastes like, well, cherry. 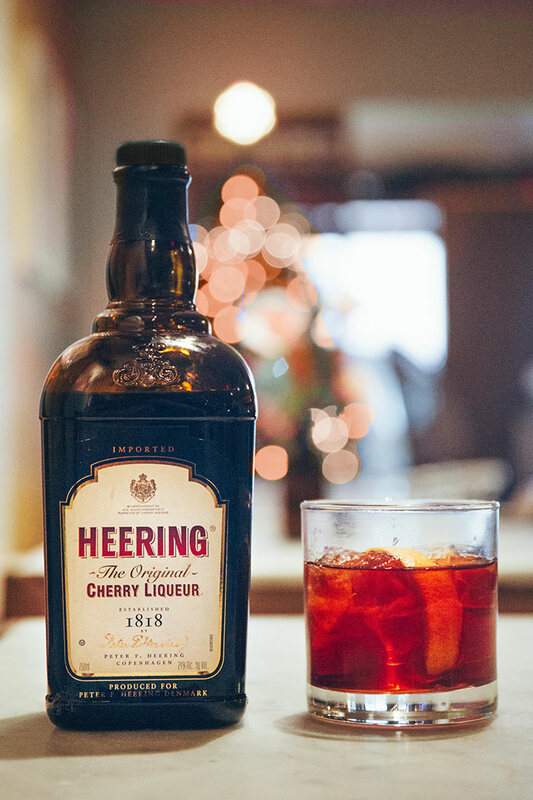 Not sugary or sticky, Cherry Heering is the bartender’s go-to for a perfect addition of natural sweet flavoring. If balance in your cocktail is something that interests you, then you should always have a bottle of Cherry Heering in your home bar. 1.5 oz Four Roses Bourbon. 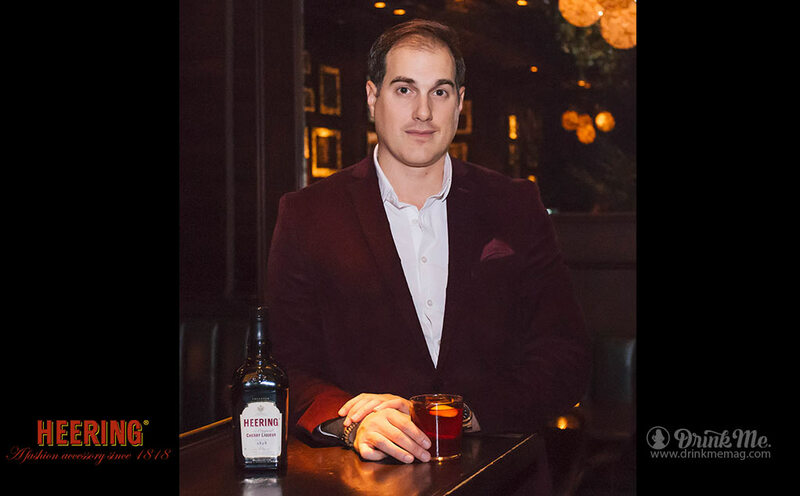 William Perbellini is Property Mixologist at the Waldorf Astoria in Las Vegas. 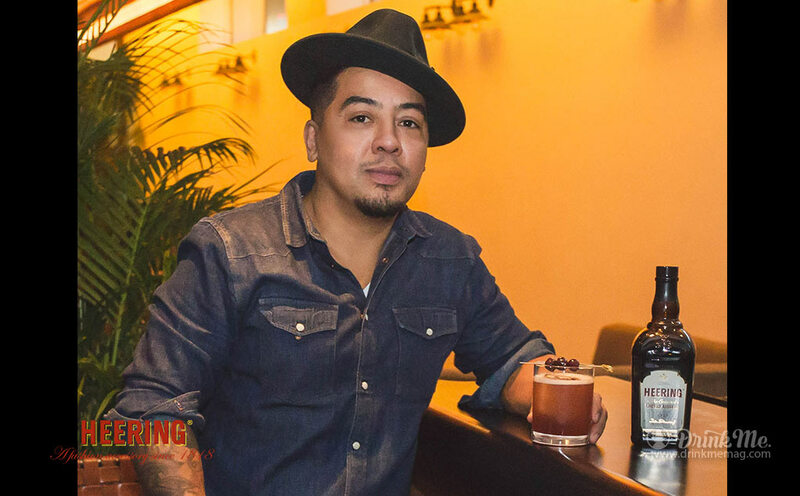 His Storm is a feat among mixologists and brings us to Day 11 of our 12 Days of Cocktails. Inspiration: Never were two souls better matched than whiskey and Cherry Heering. 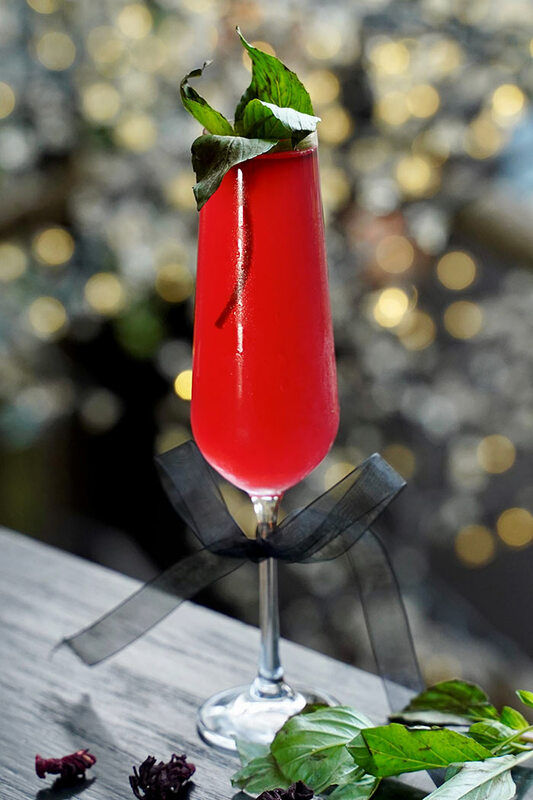 This cocktail is born out of sheer holiday spirit and manifests in the form of the most perfectly balanced holiday cocktail out there. It has everything: holiday memories of cinnamon, the depth and comfort of Talisker Storm and Bulleit Bourbon, and the sweet, but never sticky, sense that only Cherry Heering Liqueur can offer. 0.75 oz. cinnamon-infused-sweet vermouth (infuse 2 cinnamon sticks in a bottle of Carpano Antica for 24 hours). Build: Add all ingredients to mixing glass. Add ice and shake. Strain onto chilled cocktail glass. Garnish with flamed orange coin and maraschino cherry. The Musuem of the American Cocktail allowed us to borrow its Director, Philip Dobard for Day 10 of Cherry Heerings 12 Days of Cocktails. I’ve twice visited Sweden, and each visit coincided with the winter holidays, a time of year characterized by short days and ominous skies on the one hand, and vibrant colors and conviviality on the other. 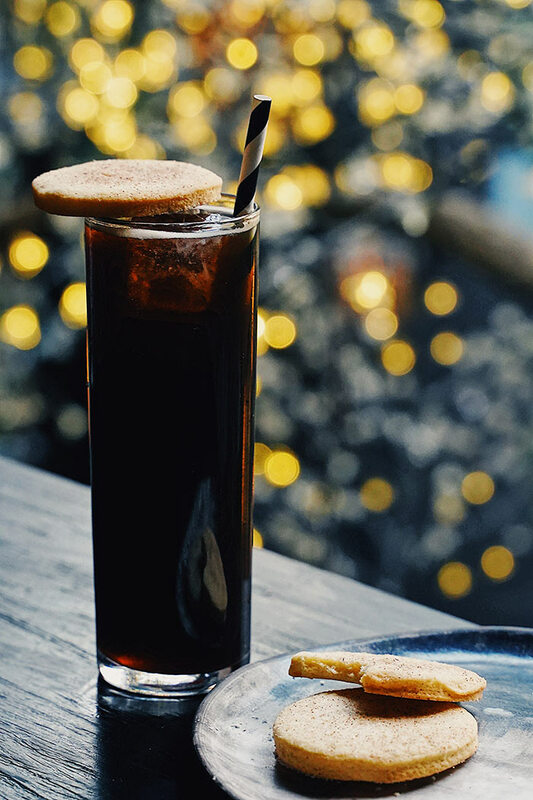 This cocktail, an obvious riff on an Irish Coffee, features hot, freshly brewed, dark roast coffee generously spiked with Heering Coffee Liqueur. It’s black as night but topped with a cloud of fresh whipped cream—a thick layer of creamy snow, if you will—and garnished with mint, a deeply green reminder, perhaps, that spring is just around the corner. Like winter in the far north, it’s a study in contrasts. Build: Blend liquid ingredients in a glass mug. Gently spoon whipped cream onto hot beverage. Garnish with fresh mint. Dakota Hart, Mixologist at The Powder Room in West Hollywood hit the snowman on the nose with this Cherry Heering-inspired cocktail. 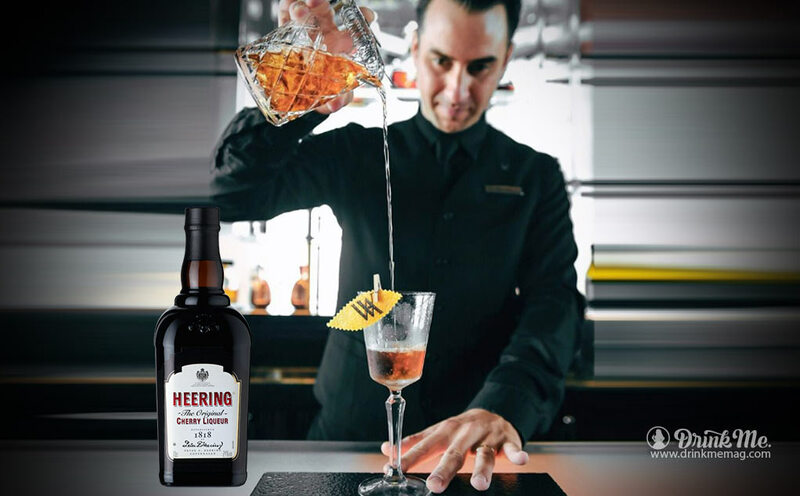 Orange flavors mixed with bitters and just the right measure of Cherry Heering are all you need to feel the season upon your very palate. Heering’s ruby red liqueur is the perfect ingredient to flavor and color your Christmas cocktails. 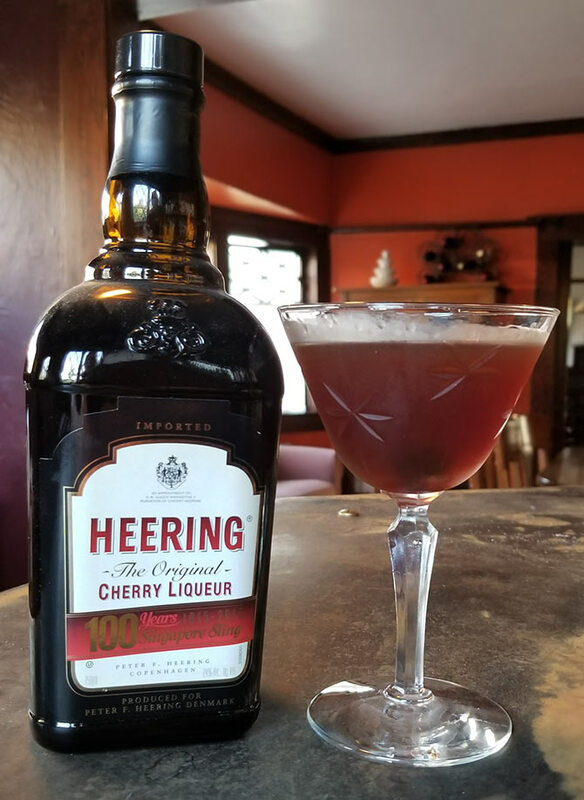 Probably the most versatile liqueur available, Cherry Heering is complex yet delivers a clean, sweet, not sticky, taste to holiday recipes including this one, the Cherry Sleigh. 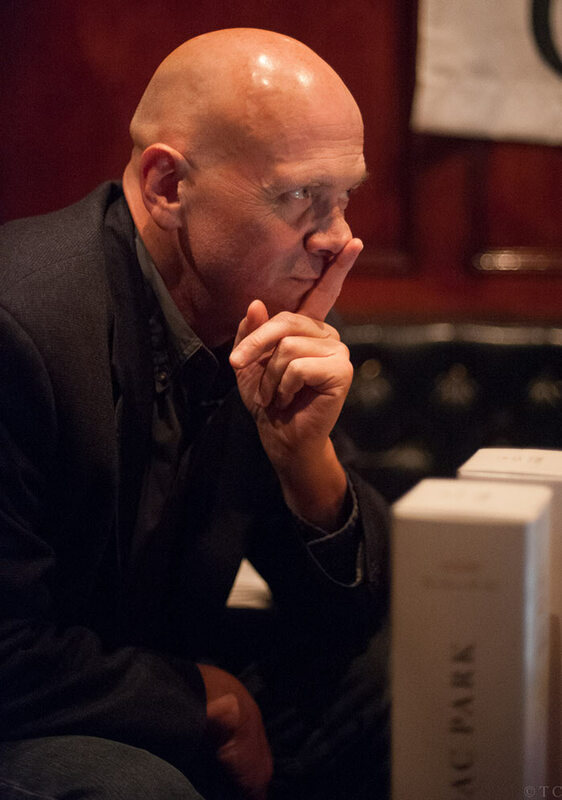 Philip Dobard is the Director of the Musuem of the American Cocktail, and Bonfort’s Wine & Spirits Editor. 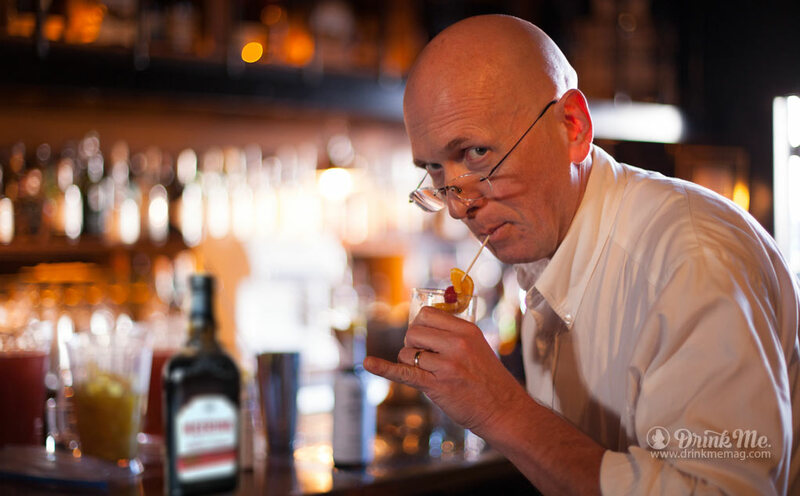 Drawing inspiration from Cherry Heering, Philip has put together this seasonal masterpiece on the Eighth Day of Cocktails. While spring into summer is the peak season for stone fruit, including cherries, I more closely associate their rich palatal satisfaction with the winter holidays. And this rye whiskey-based cocktail, a twist on the now classic Perfect Manhattan, features equal parts Heering Cherry Liqueur and dry amontillado sherry, rather than equal parts sweet and dry vermouth, plus a light seasoning of chocolate bitters. It’s cloudy, rather than clear, evoking the density of a snow cloud-filled winter sky. The palate is rich, velvety, and complex. As for the cherry, which waits patiently at the bottom of the glass, one might think of it as the sweet reward for a winter well weathered. Build:Place liquid ingredients in a mixing glass with ice and stir. Then strain into a Manhattan glass or coupe. Garnish with a cocktail cherry and serve up. Shopping, planning parties, going to parties, Secret Santas, visiting relatives, relatives visiting you (and never leaving)…we all need a helper this time of year. Fortunately this Cherry Heering recipe is the very friend you need. 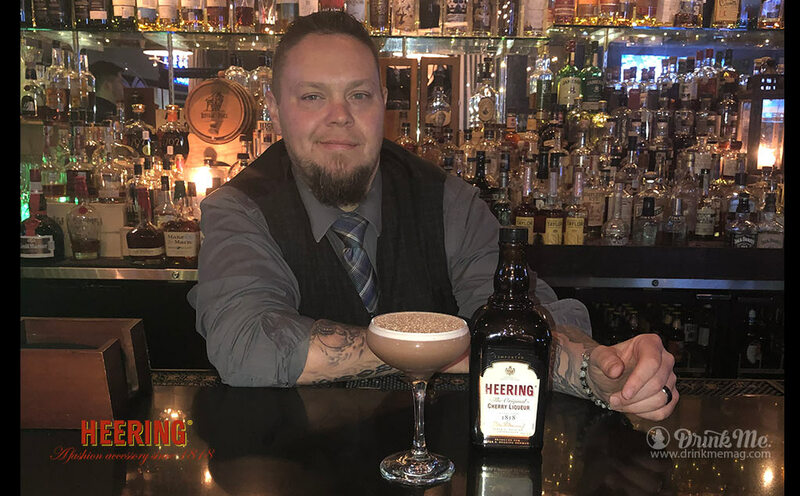 The post HEERING’S 12 DAYS OF COCKTAILS: DAY 12 appeared first on Drink Me. The post HEERING’S 12 DAYS OF COCKTAILS: DAY 11 appeared first on Drink Me. 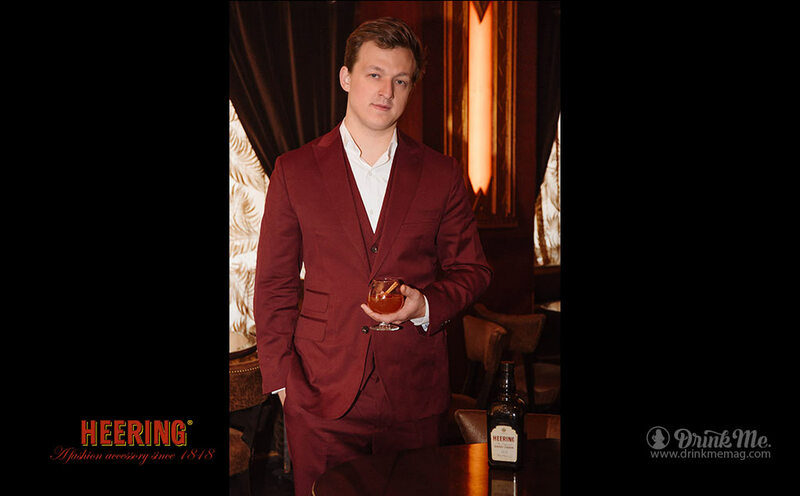 The post HEERING’S 12 DAYS OF COCKTAILS: DAY 10 appeared first on Drink Me.